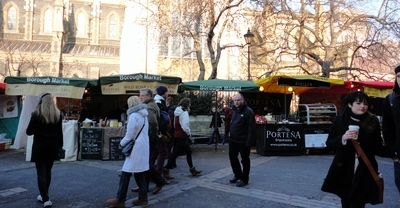 Borough Market is sited close to London Bridge and its station, near what has always been a primary route into London from Kent and the south east of the capital. 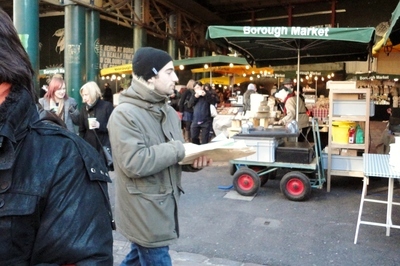 There has been a market close to Borough High Street since the thirteenth century. It was closed by Act of Parliament in 1755, but was later re-opened by local residents (at a cost of £6000). The present market occupies the same, although rather extended, site. 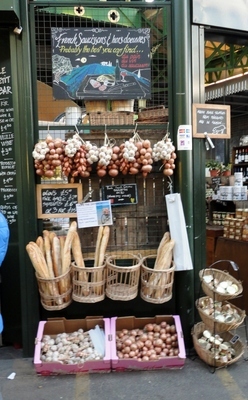 It is the only entirely independent London market and is nowadays owned by a charitable trust. 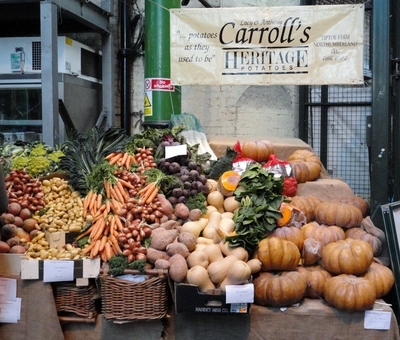 Although it was once only a wholesale fruit and vegetable market, the stallholders can now be divided into several categories. 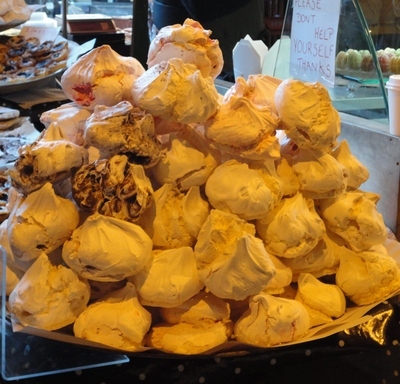 There are the artisans who create food in their own kitchens, including preserves, pates, oils, pies, cheeses, breads, cakes, pastries and confectionery. 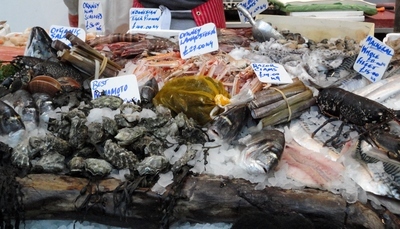 Then there are fishmongers, butchers, poulterers, greengrocers and importers of slightly more exotic produce from Italy, Croatia, Chile, Germany, Grenada, France, India, China, Argentina, Portugal and Turkey. 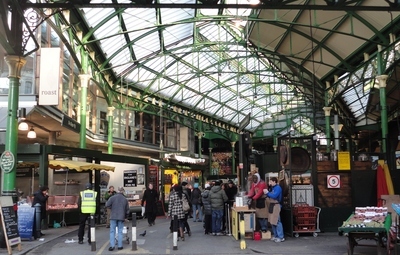 You can return from a trip to Borough Market with overflowing shopping bags, but you can also sample all sorts of foods as you work your way around the numerous stalls in the covered Jubilee Market and the open air Green Market. 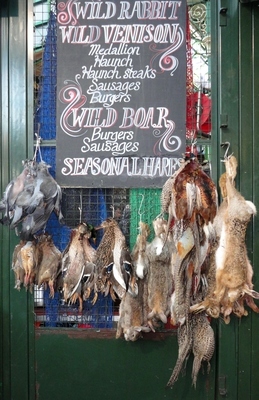 Whatever the weather you can eat on the hoof and choose from hot and cold dishes such as curries or sandwiches filled with cooked meats, and wash everything down with hot drinks, juices and smoothies, or even mulled wine. 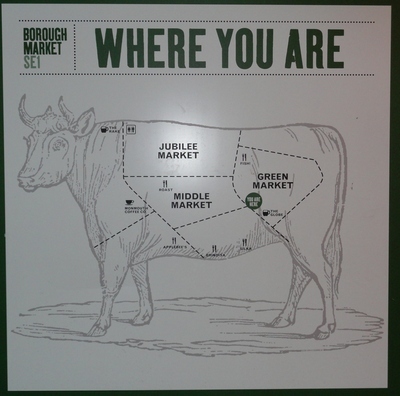 Borough Market is a byword for shopping among foodies and top chefs, who know that the produce can always be relied upon. It is also featured in films and television such as Lock, Stock and Two Smoking Barrels, Bridget Jones's Diary and Harry Potter. This place is historically significant as it was associated with famous authorCharles Dickens.